Alcudia is a municipality belonging to the Balearic Islands located in the North of the island of Mallorca between the bays of Pollensa, La Puebla and Muro. It is a very popular destination as there is more than thirty kilometers of coastline with beaches and bays with crystal clear water. The most popular of these beaches is the bay of Alcudia which is probably one of the most well-known beaches in Mallorca and most definitely one of the largest. But apart from the beaches that are most known by holidaymakers, there are also other smaller less known beaches ideal for lazy days and peaceful walks. The natural reserve areas are scattered all around Alcudia such as the Parque Natural de L’Albufera which is the most well-known one (excellent for bird watching) and the Natural area of La Victoria which is at present protected by the law of Natural Areas of the Balearic Islands. These are just two examples but there are many more areas like these in and around the bay of Alcudia and birdwatchers, hikers, bicycle lovers or mountain climbers will find themselves at home here. 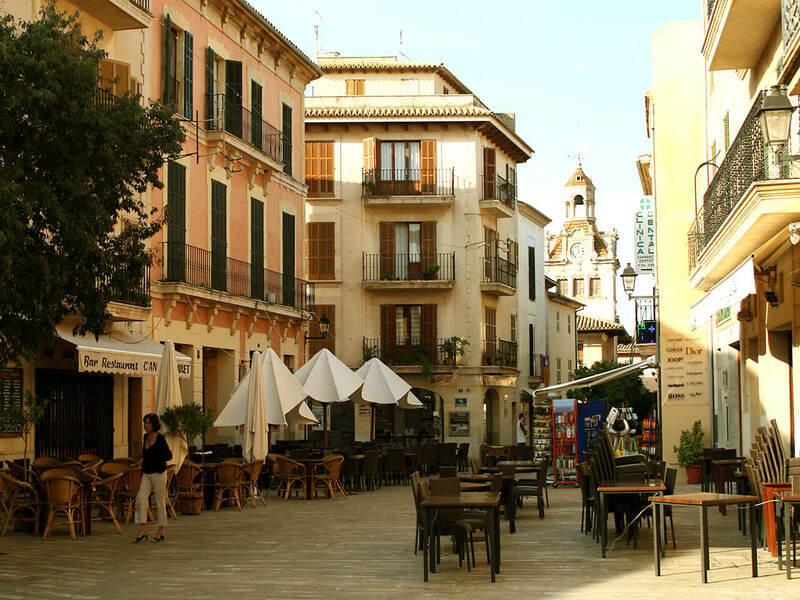 The history of Alcudia is quite splendid and is clearly reflected in the old section of the town of Alcuda which was originally a Roman city called Pollentia and is surrounded by majestic medieval walls that leave all visitors in awe. The walls were built in the XIV century as protections against possible invasions. It was designed in quadrangular form with 26 towers distributed along the perimeter of 1,5kms with 6 meters in height. Over the years it has been modified on various occasions being because of wars or reforms to reinforce the base. In 1974 the walls were declared as an artistic grouping. Every Sunday and Tuesdays at the base of the walls there is a market from 08:30 til 13:30hrs which we would recommend you visit. The combination of areas for mooring boats, the need for merchandise for the Island and transit between this Island and Menorca and other mainland ports makes this a very special port. In the 90’s the considerable augmentation of traffic, merchandise and coal made it necessary to enlarge the quay. Today, the Port of Alcudia is being conditioned to serve as an alternative to the Port of Palma for merchandise and has become the natural connection between Mallorca and Menorca by sea. It also maintains good connections with Barcelona now that the quay de Poniente has been made larger and a Passenger Station has built. It has two very different areas: the commercial area and the marina for small boats that is combined with leisure boats and fishing boats. 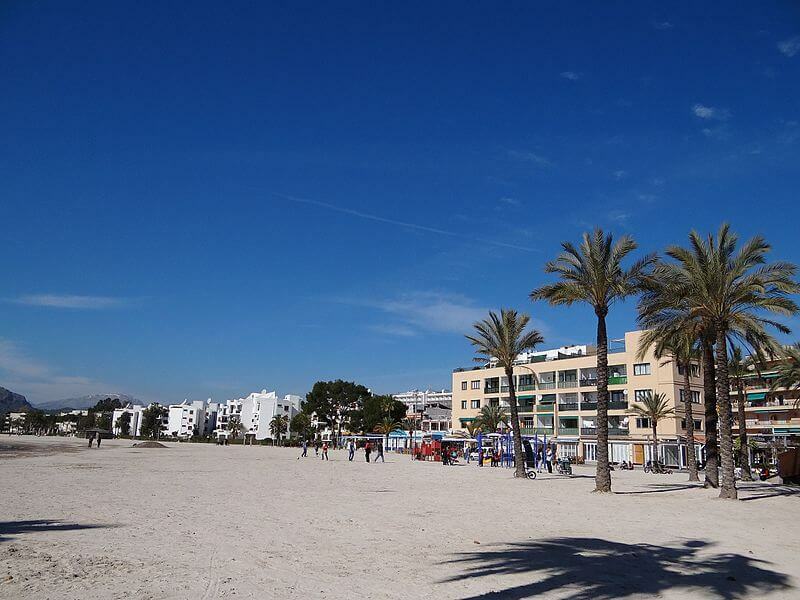 The beach of Alcudia is 3 kms away from the urban centre of Alcudia between the Platja de Muro to the South , Xara to the North and a small beach beside the Marina Alcudiamar. The beach is kilometric with white fine sand that slopes slowly into the sea where you can see spigots used to tie up the Glass Bottom Boats. There are also many canals coming from the different lakes that are formed second line to the sea, hence the nickname of the area being the City of Lakes. Due to the amount of seaweed found in this area of coastline, it is not a good place to anchor boats. Alcudia and it’s port, due to location and beaches, is one of the most popular residential and tourist resorts in Mallorca. The beach has life-guards and their instructions must be carried out. Keep your eye on the flags that explain the state of the sea. Pets are not allowed on the beach for reasons of hygiene and security. The Golf Club Alcanada is a gorgeous club with 18 holes designed by Robert Trent Jones and his son and was inaugurated in 2003. It is well situated for serious golfers that stay in Alcudia. The Club de Golf Alcanada has 58 greens and bunkers, some are difficult but there is great variety. Good golfers will find it a decent challenge, most especially holes 7 (par5) and 16 (par 4). The club is large and mountainous with gorgeous views over the bay of alcudia and the lighthouse on the Alcanada island. The club house is 400 years old and is a Mallorquin mansion which holds the club house and a restaurant close by with a lovely terrace by the sea.